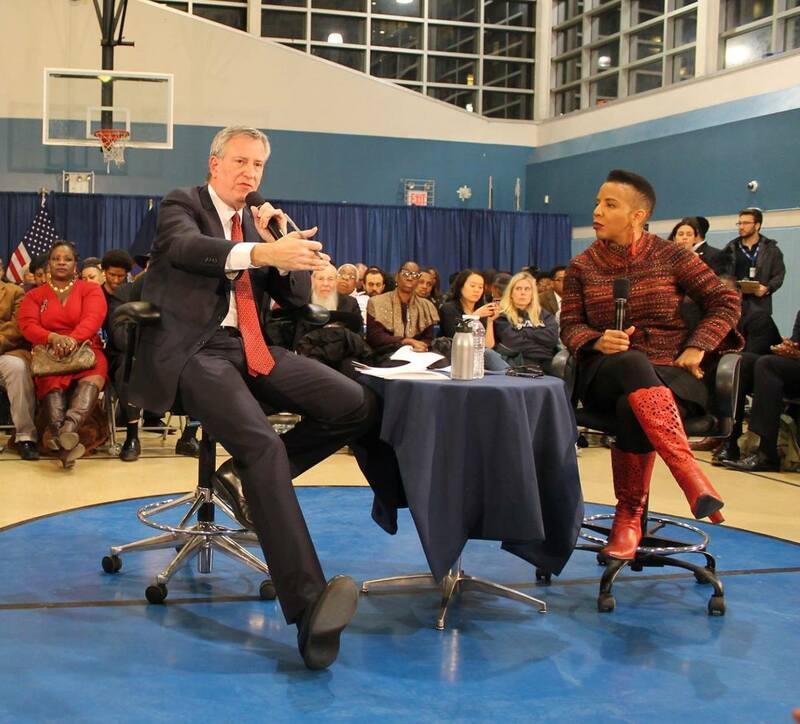 Last night, the Ingersoll Community Center was the setting for Mayor Bill de Blasio’s 50th Town Hall meeting. District 35 Councilwoman Laurie A. Cumbo opened the meeting by introducing the mayor to a near capacity crowd of engaged residents from Fort Greene, Clinton Hill, Prospect Heights, Crown Heights, and Bedford-Stuyvesant. 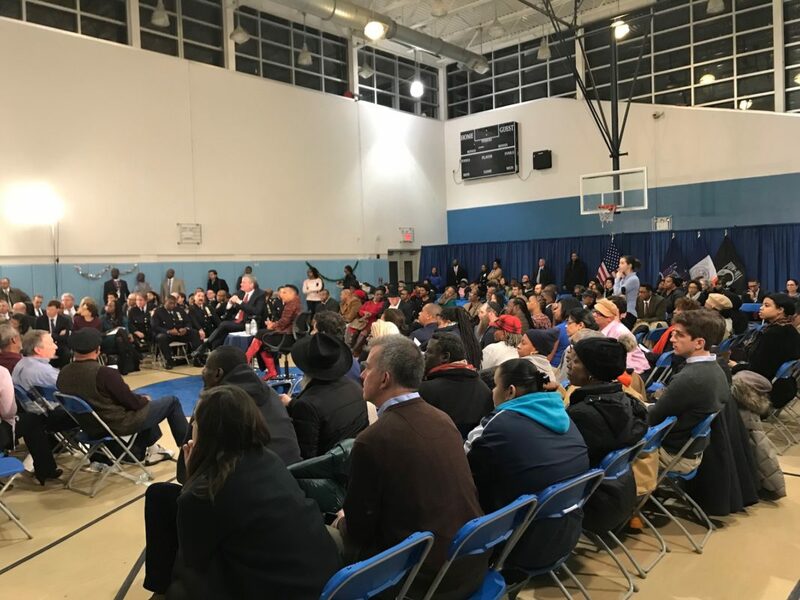 The meeting was not focused on any specific theme, but gave residents a chance to ask Mr. de Blasio any questions they may have or bring up any concerns. For nearly three hours the crowd remained relatively low-key, as a host of local and citywide topics were discussed, and an entourage of city commissioners and officials assisted the mayor in answering questions. 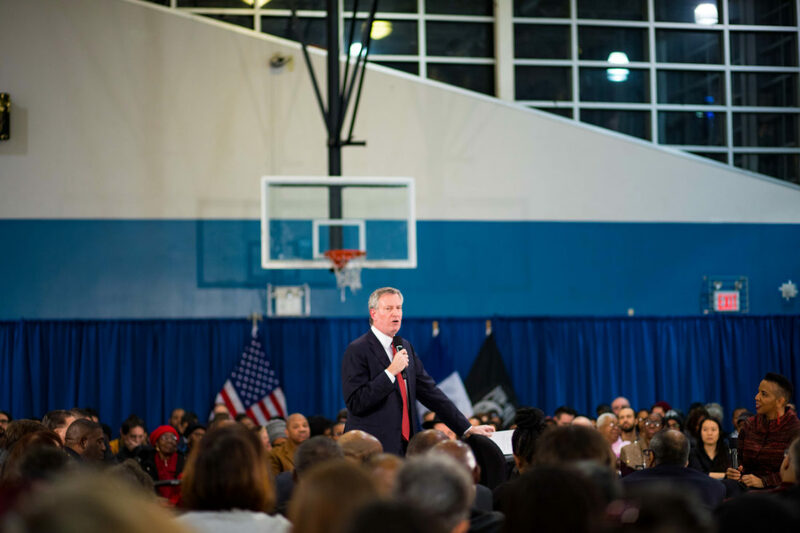 Prior to the Q&A, Mr. de Blasio asked for a moment of silence for police officers Wenjian Liu and Rafael Ramos who were shot at point-blank range and killed on December 20, 2014 in Bedford-Stuyvesant. The mayor graciously thanked DA Eric Gonzalez, Assembly Member Walter Mosely, State Senator Jessie Hamilton and Councilwoman Cumbo for her activist and change agent spirit that she has brought to the NYC Council. You may wish to know that 2017 was the safest year in New York City in half a century and that there are 2,000 more officers on patrol today than two years ago. This coming spring the “Cure Violence– Crisis Management” program will be introduced in the 88th Precinct, which includes the Whitman, Farragut and Ingersoll houses. The number of Pre-K seats was doubled in District 35. The number of after-school programs for middle school students has increased to fourteen from three, and after-school programs in District 35 reach 1,000 more children. $250,000,000 plan to protect Mitchell Lama buildings. Keeping 15,000 apartments that might have slipped into privatization and protecting them as affordable housing for the long term. Increased security cameras, lighting and layered access controls in NYCHA areas. As of January 2, cars will no longer be allowed in Prospect Park. $3.5 million investment for Elijah Stroud Playground improvements– with completion in 2018. $1.4 million investment for the Washington Hall Playground. $200,000 allocated to increase litter basket collection beginning December 21. A bit of drama ensued after the mayor’s general remarks. A contingent of protestors from Crown Heights Tenant Union, who have been engaged in a protracted dispute regarding plans for the Bedford Union Armory proposal in their neighborhood, disrupted the evening. They began to chant loudly: “Whose armory? Our armory!” until they were ejected from the meeting. Lloyd Rodriguez, who for the past decade has run youth football programs out of Commodore Barry Park, Brooklyn’s oldest park, addressed the mayor about concerns with the state of the park’s playing fields, which have long been neglected. Mr. de Blasio turned to Parks Department Commissioner Mitchell Silver, who agreed that funding was needed for park repairs. The mayor then committed that he would put “on the docket” at the next City Council meeting a proposal for $5,000,000 that will pay for lighting in the park. Sakura Amend, a parent of a student attending PS 9, stated that the school has doubled in size since 2012—the year the school lost Title 1 funding. There were approximately 450 students five years ago. Currently, there are 940 pupils in the school, a result, Amend said, of de Blasio’s highly praised pre-k program. She asked the mayor what can be done to alleviate the problem of overcrowding. Deputy School Chancellor Gibson responded that the Brooklyn East Collegiate Charter School, which is co-located in the building, has agreed to give back classrooms to help alleviate overcrowding at its partner institution. Also, the city will be revisiting the building utilization plan to see if the footprint of the two schools can be re-configured to give PS 9 more classrooms. He was answered by James Patchett, President and CEO of the New York City Economic Development Corporation, who affirmed that there was a plan in place for asbestos removal. Lucy Koteen of Friends of Fort Greene Park addressed proposed renovations at Fort Greene Park. The renovations are part of the city’s Parks Without Borders initiative, a $40 million effort to make eight city parks more accessible. This contentious proposal has seen numerous hearings and accusations. The plan calls for the removal 57 trees—a choice that Friends of Fort Greene Park and other local organizations have resisted. Koteen who said earlier today that she went into the event “curious” and not knowing what to expect from Mayor de Blasio or Councilwoman Cumbo. Silver mentioned two separate projects, saying that of the 57 trees that are proposed for removal, more than half were Norway maples, which he called “an invasive species” and at the end of their lifecycle. The new design calls for the planting of 80 new trees. Wednesday night’s event was more of the same for the civic-minded Clinton Hill resident. At the conclusion of the Q&A, the city officials were available to anyone with any complaint, question, or comment.